Properties in Novafeltria average 4.7 out of 5 stars. Property 19: Apartment in Val Marecchia, strategic location for visiting the area. Cabraldi Apartment Magnolia With Pool And Panoramic View. No children. Property 20: Cabraldi Apartment Magnolia With Pool And Panoramic View. No children. 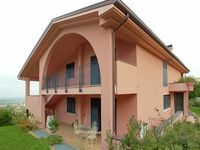 Peaceful apartments with pool in undiscovered Romagna, with stunning vistas. Property 24: Peaceful apartments with pool in undiscovered Romagna, with stunning vistas. A window on Santarcangelo ..
Property 26: A window on Santarcangelo ..
Holiday Home With Swimming Pool And Unique Panoramic View In The Appenines. Property 36: Holiday Home With Swimming Pool And Unique Panoramic View In The Appenines. Cabraldi apartment Azalea with panoramic view + use of pool. Property 37: Cabraldi apartment Azalea with panoramic view + use of pool. Family Dream Lino - Apartments for Families! Property 41: Family Dream Lino - Apartments for Families! Property 42: Apartment in Val Marecchia, strategic location for visiting the area. We had a very pleasant stay in Simones charming house in Verucchio. Everything was as described in the listing and Simone was very service minded and helpful. We can absolutely recommend this property. A holiday in the Emelia Romagna region of Italy requires an adventurous spirit. The vistas, history, unique villages and dramatic medieval castles are all here, but you have to seek them out. We had not expected the level of friendliness and local pride that we encountered among the people in the places we visited. First and foremost among the friends we made were our hosts at Casa Marilena. They went out of their way to insure our comfort and appreciation of the region. Without being intrusive, they shared their knowledge of local craftsmen, artists, products, and even farmers that grew local produce so we could adequately capture the flavor of the region. Our hosts were gracious and generous with their time and insured an unforgettable experience. We were surprised that we were the first Americans they had hosted. In that regard, we will highly recommend the service and the experience to our friends in the U.S. It was truly an undiscovered gem.